Jeff Wynn received an A.B. degree (Physics/Math) from the University of California (Berkeley) in 1968, an M.S. degree (high-pressure solid-state physics) from the University of Illinois (Champaign-Urbana) in 1970, and a PhD (Geosciences) from the University of Arizona (Tucson) in 1974. Wynn has worked for Phelps-Dodge Corporation (1970), for AMAX Exploration (1971- 1972), and for Zonge Engineering (1972-1975), where he served as Vice President for Research and Development. 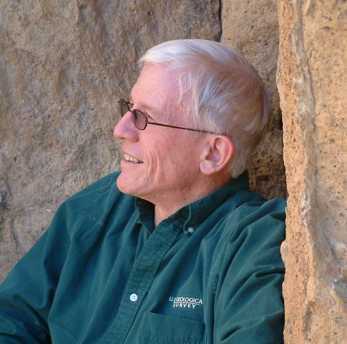 Since 1975 he has been with the U.S. Geological Survey (USGS), serving first as a research geophysicist in Denver until 1978, when he moved to the USGS National Center in Reston, VA. From 1980 to 1984 he held several rotational management positions, including Deputy Chief, Office of Mineral Resources, and Associate Chief and Acting Chief, Office of Geochemistry and Geophysics. From 1987 to 1990 he served as USGS Mission Chief ("Jefe del Grupo Asesor") in Venezuela. From 1991 to 1995 he served as Chief Geophysicist, Supervisor of the Remote Sensing Section, Supervisor of the Madinah and Makkah volcano-seismic networks (establishing the latter), and Deputy Chief of Mission for Scientific Affairs in the USGS office in Jeddah, Saudi Arabia. Wynn has published over 220 scientific papers, reports, and maps in applied geophysics (galvanic electrical, electromagnetic, marine geophysics and archaeology, potential fields, hydrology), geology (geologic-tectonic maps, economic geology, mineral resource estimation), remote sensing, volcano-seismic monitoring, astronomy, and archaeology. Wynn served as Chief of the Offshore Industrial Minerals Project (an unusual project directly funded by the Dept. of Interior Technology Enterprise Office). Wynn was awarded two patents for marine induced polarization (a demonstrated buried wreck finder) in June, 2001, and a CRADA to commercialize the new technology to map the sub-seafloor electrically was signed in August 2000, leading to exclusive license(s) to this technology. A third patent is pending. Jeff has also provided geophysical support to the Southwest Hydrology & Mineral Resources Project, including mapping the groundwater in the southern San Pedro River valley in Arizona and Mexico in three dimensions using airborne EM methods (USGS Professional Paper 1674, published in 2006). From 1996 through 2001 he served as a geophysical consultant on the Duncan-Zarembo and Ketchikan (southeast Alaska) Resource Appraisal Projects. In 2002 Jeff became Chief Scientist for Volcano Hazards, and moved from the USGS National Center in northern Virginia to the Cascades Volcano Observatory in Vancouver, WA. In this capacity he supervises the USGS volcano observatories in the western US. In 1994 Wynn was awarded the Dept. of Interior's Meritorious Service Award for Excellence in Scientific Leadership and Management, as well as several STAR awards (1999, 2000, 2002, 2003, 2004, 2005, 2006, and 2007). Jeff is fluent in Spanish, can communicate in French and Arabic, and is currently working on Russian. Until 1987 Wynn held adjunct (full) professor rank and taught several classes at the University of Maryland (College Park, Maryland). From 1979 to 1987 he was also a Full Professorial Lecturer at The George Washington University (Washington, DC). From 1994 to 1998 he was an Adjunct (full) Professor and External Examiner, Faculty of Earth Sciences, King Abdulaziz University, Jeddah, Saudi Arabia. From 1983 to 1987 Wynn served as Special Editor and Associate Editor for the journal GEOPHYSICS, and from 1990 to 1992 served as Chairman of the Society of Exploration Geophysics' International Affairs Committee. Jeff served as General Chair for SAGEEP-2000, the annual scientific meeting of the Environmental and Engineering Geophysical Society, held in Washington, DC, 20-24 February, 2000. From 2002 to 2003 Wynn served as President of the Environmental & Engineering Geophysical Society. The BBC/Discovery Channel filmed Jeff at Meteor Crater, Arizona, for the series "HyperSpace", aired on The Learning Channel on 7 October 2001 and several times since then. He has also been featured on BBC World Service radio, BBC Horizon Television and Brazil Idea TV in episodes related to meteorite impacts, and on Peruvian TV about the eruption of Mount St. Helens. In November 1999 the International Astronomical Union renamed a Mars-crossing Phocaea-group asteroid "9564 Jeffwynn" (Nov 1999 Minor Planet Circular (http://volcanoes.usgs.gov/jwynn/9564jeffwynn.html); See also the Minor Planet Lists: http://www.cfa.harvard.edu/iau/lists/MPNames.html . Jeff earned the 2000 Grand Masters' Gold Medal in Combat Sombo (the Russian national martial art) at the World Martial Arts Championships held in Orlando, Florida. He also holds a 4th-degree black belt (Yodan) and is an American Jujitsu Association-certified Sensei (AJA Instructor Certificate TC-0406-2300), teaching self-defense and advanced Jujitsu classes as a community service at the Firstenburg Community Center in Vancouver,Washington (http://www.vancouverjujitsu.org). Jeff has taught numerous no-charge womens' self-defense clinics in northern Virginia and the YWCA and various churches in Vancouver, Camas, and Washougal Washington. Jeff is a National Safety Council Certified CPR/AED instructor, has taught numerous First Responder classes, and has also served as a coordinator of the USGS National Center volunteer cardiac emergency response team.